We wanted to be able to watch YouTube on the living-room TV, so I bought an Amazon Fire TV. Living in Kyoto, I bought the Japan-market version that they warn can be used only within Japan. Fair enough. An Amazon account is required for most things to work. Not a problem for us, obviously, but would be if we were gifting it to someone. You must have it registered in your Amazon account. It must be a Japan-based credit card. You must configure it for use with “1-click purchases”, even if you explicitly don't want that dangerous feature active. None of these are disclosed, nor make any sense for a free app showing free content available freely, to be used on a device that you own outright. I was able to install other apps without problem. If your situation doesn't fulfill all these requirements, you're not told an up-front “you need a Japan-based credit card configured for the 1-click feature”. Instead, you're presented the dialog shown at the top of this post and left to figure it out for yourself. First off, it starts out with “Purchase Failure”, which is confusing because you're not trying to purchase anything. The app is free. The button to install it says “Get”. This dialog is the first hint of “Purchase” to be encountered. It makes no sense. Then it talks about “billing address” and “payment method”, but makes no mention of where it's looking for these. It doesn't even indicate who is complaining. Well, this error dialog pops up when merely trying to install the YouTube app, so I figure that the dialog must be from the Amazon Fire TV. YouTube is free, after all. So, I dig through the settings in the Amazon Fire TV, and find nothing whatsoever about this. They do provide a way to purchase “Amazon Coins”, which are apparently required when wanting non-free apps, but it seems not to be relevant here. I wonder whether they require a Japan-based credit card in your Amazon account. I don't have a Japan-based credit card, but Fumie does, so I re-register the Amazon Fire TV to her Amazon account. It doesn't work.... 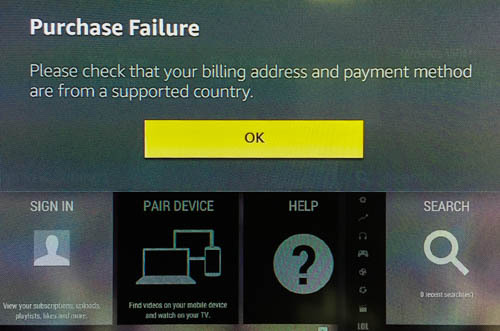 I get the same “Purchase Failure” dialog as before. Grasping at straws and digging around in her account settings at Amazon, I see that the billing address for her Japan-based credit card has an optional part of the address empty, so I try filling that in. It shouldn't matter, but I'm grasping at straws. Searching all over creation (that is, The Internet), there's nothing about this until I read something related to Amazon from four years ago, suggesting that something would work if you register a credit card with their “1-click purchases” feature, in which you immediately buy something by accidentally clicking on a single link. I try to do this in Fumie's account, but since I had made a tiny change to the billing address of her credit card, Amazon wouldn't let me use that credit card for anything new until I could prove that I actually had the card by re-entering all its details. This is a great security feature that stops people who break into your account from using your card to ship stuff to their new address, but it's really biting me now because I want to get this set up for Fumie before she gets home, but she has the card. Along the way I submitted a help request to Amazon, and they responded promptly and politely and were completely unhelpful. First they suggested that I set the 1-click purchase method to “COD”, but that option is simply not available. Then they apologized and said that a Japan-based card is required to install any app, which I pointed out was demonstrably false since prior to trying the YouTube app I had successfully installed and used two other apps. Then they said essentially shrugged and said sorry. Anyway, hopefully this will help others searching for a solution to the same problem. I’ve sent your post along to some folks, hopefully a help page to address this will show up soon. That is just weird. I had no issues installing the YouTube app on my firestick. And while I already DO have a credit card on file at Amazon, I most emphatically do NOT have the horrible one-touch ordering enabled. They force it to be enabled for digital content – which is really, really annoying, but I have it turned off for everything where it can be turned off. I wonder – if I sent my American installed Firestick to you, would it just work in Japan do you think? You should have used an android phone or tablet with an app called Apps2Fire to install any app you have installed on your android device to your Fire TV and saved yourself all the trouble. Here is a you tube vid on what to do. Damn… why do we need a credit card for free apps?!?!?! And whats worse is that since you wrote this post nothing changed! So I have something similar. I’m UK, based and keep getting the same message as I have read above about ‘purchase failure’s, Amazon have been useless. I’m now at the stage of cancelling all membership options with them. 6 months later, hours of phone calls, “reseat your device” “deregister your device”. The latest assistant told me he’d “never heard of this issue before”. If anyone has any help on what I need to do, please tell me, before I go mad. All I want to download is free apps, the most stupid thing is I can’t even download Amazon apps! If I deregister the one click option will it okay? on how to download from Android phone but not successful. I have the same problem on my fire hd. Were you able to fix it?